Dave Cross Online - "Finish the Sentence"
World famous Photoshop expert and all around nice guy Dave Cross has included me in his blog series "Finish the Sentence". Thanks Dave for including me in your series. 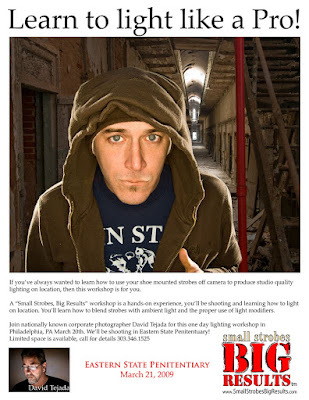 Due to the overwhelming response to the up coming "Small Strobes, Big Results" workshop at Eastern State Penitentiary, I've decided to add a second workshop on Saturday March 21, 2009. I have space for an additional 5 participants for the second workshop, if your interested in attending I will need to hear from you in short order. Just email me for details. Thanks so much for the wonderful response for this workshop, this is truly a wonderful location to be shooting in. I have just completed my first Mentor Series Trek and I must tell you, I had a blast! I really enjoyed myself, making new friends, laughing and sharing stores. The evening prior to the trek the staff met for dinner to go over the details of the trek. It was here that I met the other two mentors and trek organizers from Popular Photography. The other mentors, Bill Durrence and John Reddy are terrific guys and excellent teachers. Our organizers for the trek, Erica Johnson and Vanessa Vazquez from Popular Photography are sweethearts. The organization of the trek was fantastic, thank you Erica and Vanessa for all your hard work, you are true professionals. I can see why so many of the trekker's where returning to do their second, and in some cases their 4th and 10th trek. 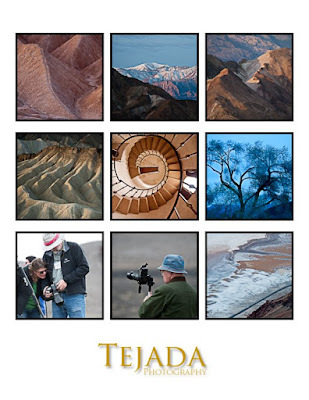 The Mentor Series provides wonderful travel locations, fantastic photographic opportunities and experienced instructors to teach photographic techniques and answer questions. I had the opportunity to provide two light demos using the Nikon CLS method as well as a bit of light painting while on location with my group one morning. This old dog learned a few new tricks from my fellow mentors on the trip. Wow, I just can't say enough. 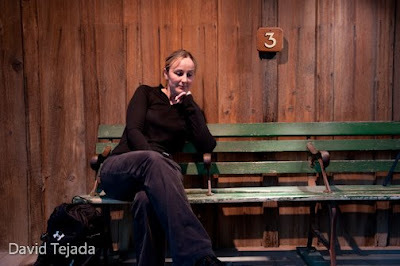 This is a photo of Kate, one of my trekkers from day two. We did a quick 2 light set-up. Below is a photo of Trever after an evening of image reviews. This also was a two light set-up, SB-800 shot through an umbrella for the key and another SB-800 with a CTO on the back wall. 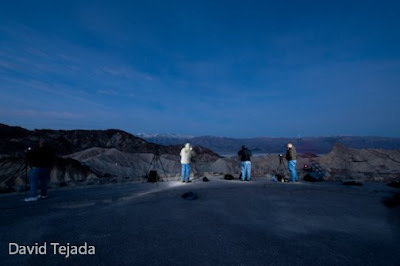 Shown below is the light painting I did of several photographer setting up for sunrise at Zabriskie Point in Death Valley. The exposure was around 30 seconds or so. The Mentor Series of Treks are fantastic, they have several new destinations to choose from. For more information regarding their treks, click HERE. Up coming treks include: Alaska, Mexico, Chicago, Nashville and many others. Here are more images for the trek. I'm currently sitting at the gate on concourse B at DIA and wouldn't you know it, my flight is late. 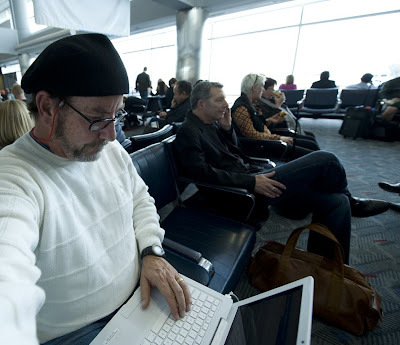 I'm headed to Las Vegas to meet up with the other mentors and representatives from Popular Photography for my first Mentor Series Trek. 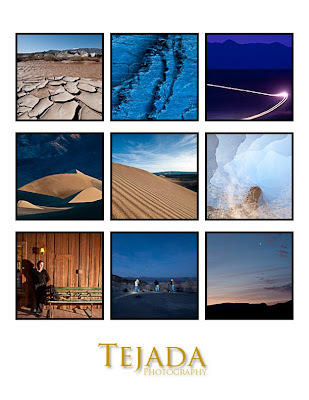 I'll be participating on my first Mentor Series Trek, where headed to Death Valley, CA for 5 days of shooting and instruction. I'm really excited to be involved with the Mentor Series, I hope this will grow to more treks for me in the future. Usually there are only 2 mentor per trek which allows for a maximum of 20 participants per mentor. We have added an additional mentor due to the Park Service requirements of limiting the number of persons at any given location to 12 persons. I'll be learning more about this later this evening during dinner in Las Vegas. I will try to continue posting while out on this trek, I know my days will be long and the morning will be arriving early. I'll do my best to keep you informed what I'm experiencing and how things are going. 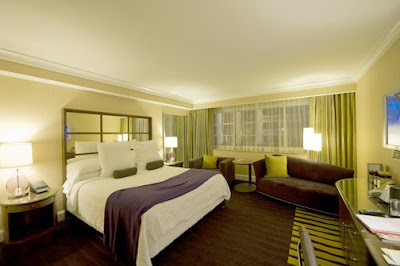 I made it to the hotel an hour late today, the room is comfortable and I'm looking forward to dinner. I received a call last week from Bank of the West in San Francisco, CA. 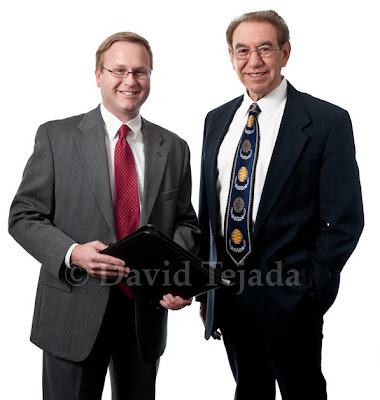 The director of communication needed a portrait of one of his bankers with a client for their annual report. The photograph was to be taken at the clients location in Westminster, Colorado. I was provide a sample photo that was taken by another photographer in another city to match the lighting on the subjects. The background in the sample photo was not a true white, rather a dull gray... poor execution in my mind. We arrived at our location and found the conference room filled with a large table and about 20 chairs. We spent about 5 minutes pulling chair out and placing them in the hall way and pushing the large table to one side. We put up a 9 foot white seamless for the background which fit right up to the conference table. I used the surface of the conference table to position one of my background lights. We used a total of 3 SB-800's fired via CLS from the commander unit built in on my Nikon D700. I used two SB's for the background illumination. 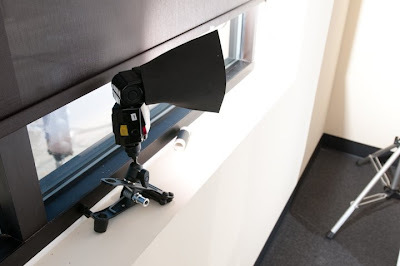 Both strobes where mounted on Justin Clamps, one strobe placed on the conference table and the other on the window ledge. Both of the background strobes where set to 1/4 power group B. 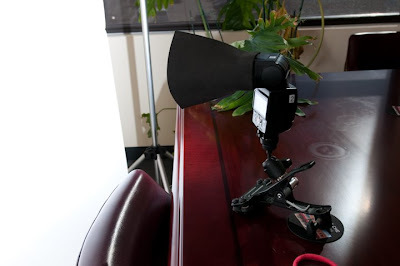 You can see my foam gobo's placed on the head of both strobes, these are used to prevent light spilling on my subjects. 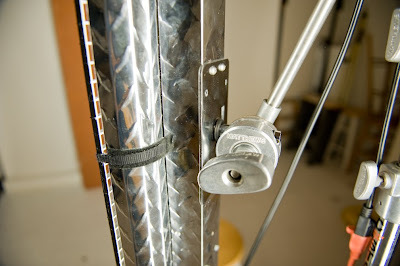 The key light was also an SB-800 on a Justin Clamp and place on the back of a large Octa box. This strobe was set to 1/2 power and was placed in Group A.
I was able to use two groups on the CLS system for this lighting set up. The two strobes lighting the background are a "matched" set. Both strobes required the same amount of power out of each strobe and therefore could be place in the same group. With the CLS system, all strobes placed within the same group, in this case group B, each of those strobes receive the same power that the command unit is set for in that group. On both my D300 and D700 cameras, the built in command unit will only control two groups, A & B. If I needed a third group C to light the shot, I would have to use an SU-800 command unit or another SB-800 as the commander. In order to get a clean white for easy knock outs, your background needs to be about a stop and a half brighter than the key light on the subject. You can see here with the background lights turned off we had sunlight driving through the blinds and projecting the window on the seamless. I was able to even out the light with the power settings on the background lights. Here is what the final image looks like. This is the layout I had to work with for the above photo. 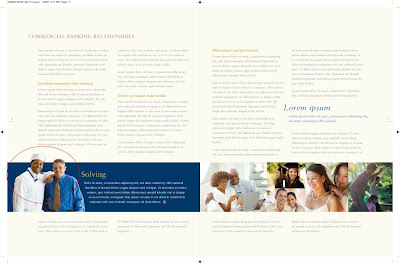 The subjects above will be removed from the background and inserted into the circled location on the layout design below. 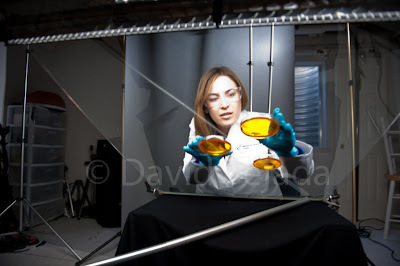 The other day I spent a few hours in the studio creating the following photograph for a client on mine. 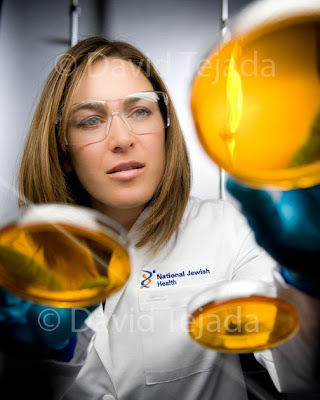 My client is actually a design firm that wanted a photograph of a lab technician wearing a lab coat. 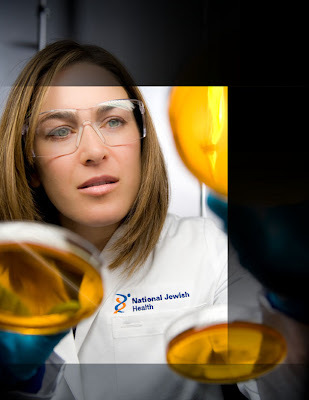 They had the lab coat embroidered with a new logo design they created for their client "National Jewish Hospitals". The photograph is going to be used for the cover of a "Case Study" piece they are designing show casing the work they have produced for their client. My client will be using a frame like the one below to frame the image and to place type around the edge of the photo. I started my business here in Denver back in 1983 and it was this design firm Monigle & Associates that I shot one of my first professional assignments. I'm very proud to say that they are still clients of mine after 26 years! Professional service and quality work keeps them coming back year after year. The lighting was quite simple, the main light was a DIY Home Depot florescent light with a grid attached and the background was lit using an SB-800 fired using a PocketWizard. 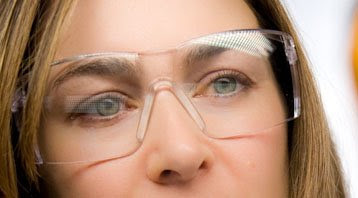 The grid on the florescent light was used in order to create interesting reflections in the models glasses. In order to hold the glass in place, I used two Bogen Super Clamps as stops on a pair of sawhorses and a background stand in the front of the set to support the glass. I used black fabric in front and below the glass in order to kill any unwanted reflection. The background consisted of a short roll of gray seamless and several light stands as design elements. 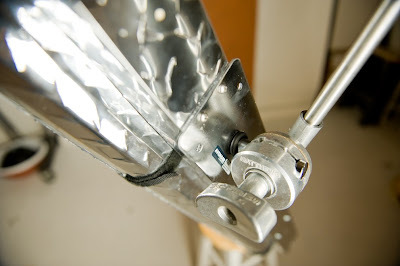 The photo below show the Bogen Super Clamp configuration to hold the forward section of the glass. You can also see extra weight on the stands to secure the entire set-up as well as the view from the subjects prospective. Here are just a few more production still from the shoot. The pole you see on the black fabric was placed there for a reflection through the photo. The florescent light are wonderful light sources but do not travel well. 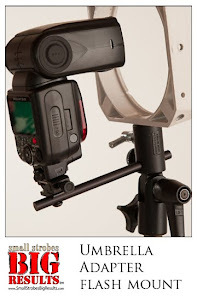 I use them only in the studio or in town shoots. There is a lot to be said for shooting with a continuous light source, You get what you see. For me, one of the biggest reasons for using "cool" lights like these is for the comfort of the subject being photographed. As photographers we're use to the pop of flashes when using strobes however, subjects not use to being photographed sometimes find the flash of strobes uncomfortable. 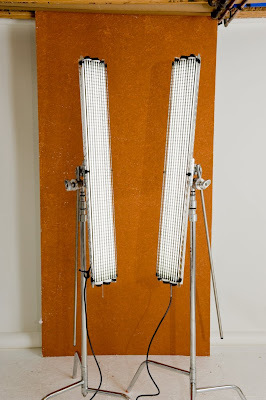 I bought these two shop lights at Home Depot for about $30.00 each. These are called Lithonia Lighting Diamond Plate Utility Lights. I used daylight balanced tubes in the fixtures. 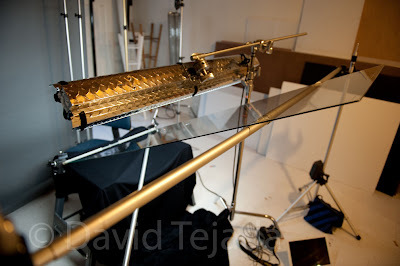 The lights are good size and quite light in weight, they measure 48" in length. I also picked up the grid ceiling fixture that you see in overhead lighting in typical office spaces. I cut these plastic grids down to size to fit over the two tube fixture. I really like the diamond pattern on these lights, kinda looks like professional lighting gear not DIY. Here you can see the Velcro™ straps I use to hold the grid in place, I use 6 attachments along the sides of the light, three on each side. In order to mount the lights to a stand, I bought a mounting plate know as an Avenger F800 Baby Wall Plate - 3"
You will need some sort of Grip Head to hold the Wall Plate or light. 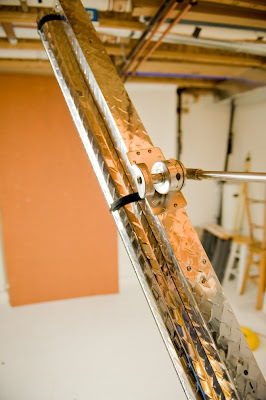 If you have C-stands it's simple, if not use something like this to get you light on a stand. 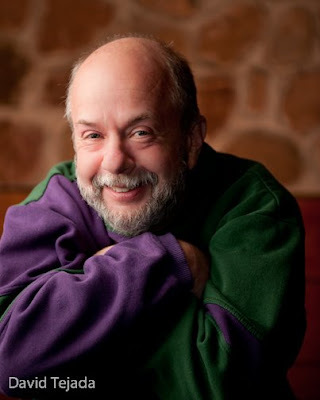 I'm very honored to be speaking to and visiting with the Colorado Strobist Group! 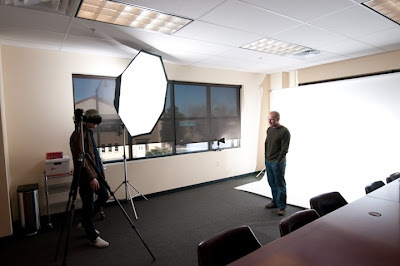 On February 8th, 2009 at the North Denver Photography Studio in Northglenn, Colorado. We'll be starting at 4 PM and ending when the final questions is answered. I'll be showing a body of work from various corporate assignments and discussing how many of those images where created. I share some tips and tricks about lighting and I'll be answer all your questions regarding business, workflow and anything else your interested in. If your interested in attending, I've been told that there is a $10 admission fee for the rental of the location where this event is being held. 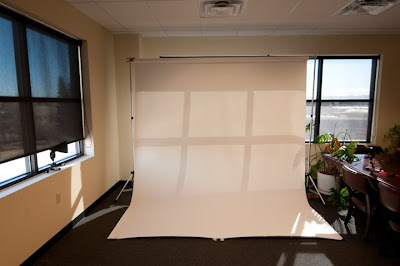 The location and directions to the North Denver Photography Studio can be found HERE.